Deciding which plant to cull is a hard decision. When I'm deciding which plant to go with I like to look at the parents and see how they looked and look at the health of each plant. Some plants will be aggressive growers, but that doesn't indicate how big of a pumpkin it will grow. I've heard more than one world record holder say, "It was my third best plant, but once it set fruit the pumpkin wouldn't stop growing." Because of this I like to find out what kind of traits mama and papa had and see how your plants compare. If mama and papa were aggressive growers but your plant isn't very aggressive then it might be a less desirable plant. If mama and papa weren't aggressive growers and your plant isn't aggressive then that might just be its genetic trait. Skinny vines and thick vines are kind of the same thing. I love a thick looking vine, because it looks cool, but it doesn't indicate a big pumpkin. However if mama and papa had thick vines and yours seem kind of wimpy it might be a less desirable plant. Probably more important than the before mentioned items are things like the color and the overall health of the plants. Again, a darker color can sometimes be a genetic thing, but I would take a dark green leafed plant over a lime green plant. If you planted on plant later than another I wouldn't worry too much at this point of the season if that one plant is "behind." 8 days doesn't mean much at this point of the season. If you are only 8 days behind and the plant sounds like growth wise it might be only 4-5 days behind then two weeks from now the plants might be equals. What you find is that as far as what will effect pumpkin growth, there won't be much of a difference. If you are pollinated by June 24-28th you'll be in great shape and more than likely both plants would have females pollinated by then. The key is to have a plant big enough by the 24th and it sounds like that will be the case. Where the rubber hits the road is around day 24 after pollination. That is when that plant needs to be fully primed and as big as possible so it can throw all of its energy into that pumpkin from days 24 to day 40. The reason that 8 days different doesn't mean much in terms of the pumpkin is that the 8 extra days only really count at the end of the season when the pumpkin is only putting on 4-5 pounds a day. That basically means 8 days now means 32-40 pounds later. 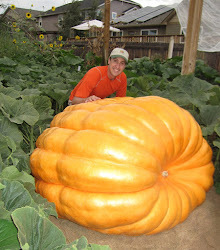 In that day 24 to day 40 you want that pumpkin doing close to 40 pounds a day so that is the make or break part of the season in most cases. For the two plants from the same seed, if all things are equal, find out if it is the 1530 Gehweiler or the 1067 Kent that has the thicker vines and go with the one that has the traits you like the most. It looks like both of those plants have grown similar progeny so this one is a push. Last thing to look at (and it is the least obvious) is the root system on the plants. If you are running into roots when burying vines father out on one plant than the other, go with that plant.